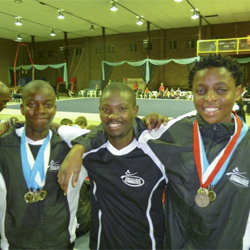 WELL DONE to Siboniso Mhkize & Immanual Ramalapa who recently won Silver and Gold overall at their National Championships. They also won various apparatus medals. They are pictured above at the MATS Sports Centre with their proud coach, Goodenough Mncwabe. Congratulations to all 3 of you. This is a wonderful accomplishment !